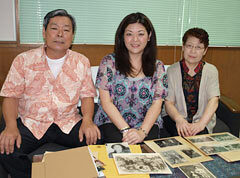 On June 13 at Yomitan High School, Brenda Nomura met her relatives, Yasunori and Fujiko Matsuda for the first time. Nomura’s great-grandparents, Kensai and Kama Matsuda, were from Owan in Yomitan. In 1906, Kensai emigrated to Hawaii, before returning to Okinawa and moving again with Kama eight years later in 1914. Nomura’s father was a father, who was a descendant of Japanese immigrants from Yamaguchi and Hiroshima and her mother was also a descendant of Okinawan immigrants. Nomura was very keen to meet her relatives in Okinawa. Tom Yamamoto, who visited Okinawa with Nomura, asked his friend living in Yomitan, Masaji Matsuda, to help, and this led to finding Yasunori and Fujiko Matsuda. Pictures of Kensai taken when he returned Okinawa in 1950s, and their store name, Miya-Machida, proved decisive in the search. Their first meeting was at Yomitan High School, where the students from Hawaii had an exchange program. Through finding her relatives, Nomura was impressed by the strength of the network of Okinawans.